Now that the hangover clouds are clearing over the Aussie World Cup champions, Twitter has taken a look back at how the social media platform performed during the cricket world cup. Throughout the entire tournament (from 14th Feb to 29th March) there were more than 1.4 billion impressions of Tweets related to #CWC15 during the 49 matches. The most talked about moment of the tournament on Twitter occurred when Grant Elliott hit the winning six sending NZ through to the final of the #CWC15. The most re-tweeted post of the tournament came from Indian prime minister, congratulating the Indian team on a match well played in the #INDvPAK match. The most-followed match was the semifinal between Australia and defending champions India. Not surprisingly, the traditional #INDvPAK rivalry in the group stages was the second-most engaged with game on Twitter. 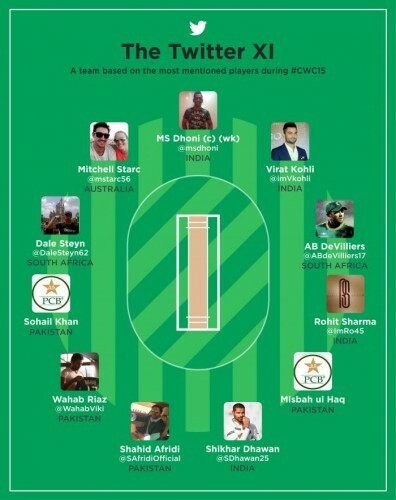 Twitter also complied a ‘dream team’ of the most mentioned players of the series. The most-mentioned player, Indian captain MS Dhoni was named captain of the dream team.